Mauboussin has a long and illustrious history, beginning in 1827 when Mr. Rocher and Baptiste Noury established a jewelry shop in Paris. In 1850, Noury assumed control of the business which, in 1896, was transferred to his nephew, Georges Mauboussin. 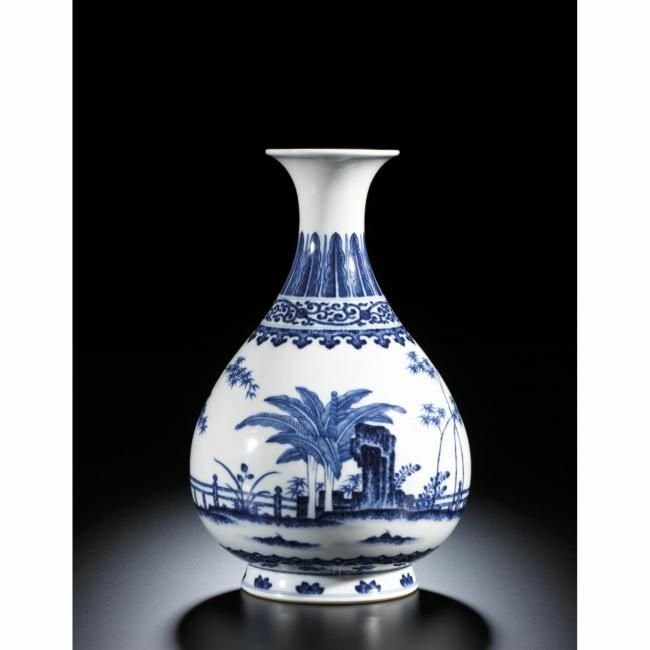 During the first four decades of the new century, Mauboussin contributed exhibits to the major international expositions including Milan in 1923 and 1924; Strasbourg, 1924; New York, 1939; and Paris, 1925, 1931 and 1937. At the 1925 Exposition des Arts Décoratifs in Paris, they were awarded the Grand Prix and, for his contributions to the world of joaillerie, Georges Mauboussin was given the prestigious "Legion d'Honneur." During the 1920s, the firm maintained branches in London, Buenos Aires, New York and Palm Beach. Mauboussin is most noted for their creations during this decade, at the height of the art deco period when they produced not only important designs in the rectilinear style characteristic of the decade but they also introduced truly remarkable jewelry that has come to be known as "Tutti Frutti" or "fruit salad." These jewels featured naturalistically engraved gemstones in leaf, berry and blossom shapes that were based on the Islamic flower cult of the Mughal emperors. Although these gemstones were not as valuable as perfectly cut stones, their polychromatic effects were so striking that they became sought after by discriminating clients during the period. 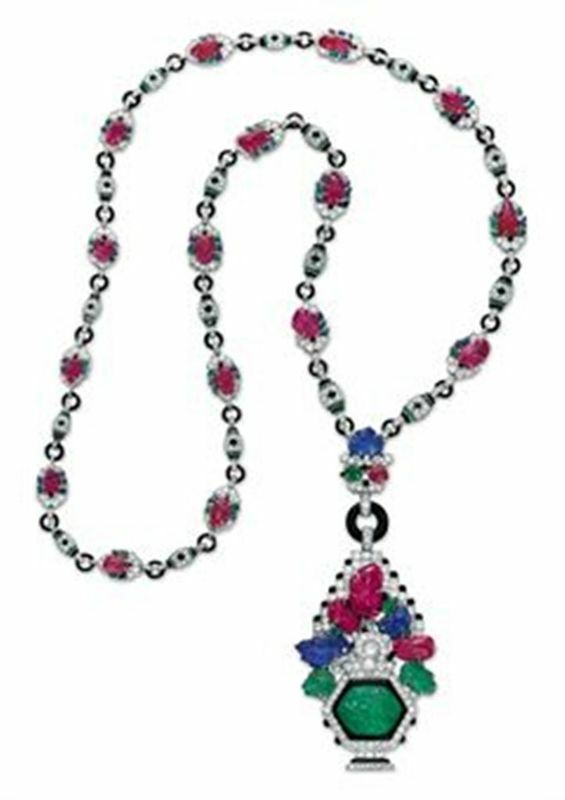 This sautoir is an example of the best "Tutti Frutti" offerings from Mauboussin in which the engraved gemstones are incorporated into the design of both the pendant and neck chain. The "Vase de fleurs" pendant is made up of a hexagonal diamond-set flower pot centered by an emerald engraved with a flower. Out of the pot grows a diamond-set stem from which spring engraved ruby and sapphire flowers and emerald leaves. As a nod to the geometrical paradigm of the period, on either side of the floral bouquet is a stepped contour, reflective of the abstract patterning found on the architecture of ancient civilizations such as Babylonian ziggurats and stepped Mayan and Aztec temples. A small black onyx sphere on each step softens the pure linear design which could otherwise have been static. A simple black onyx ring joins the pendant to the neck chain. The latter consists of alternating links of floral clusters, each with an engraved ruby blossom surrounded by emeralds, sapphires and diamonds, and separated by onyx rings to diamond, emerald and black onyx barrel shaped links. As a remarkable feature of this necklace, its reverse which is just as beautifully crafted as the obverse with all the engraved gemstones also engraved on the underside. Commentaires sur An art deco diamond, multi-gem and enamel sautoir, by Mauboussin.